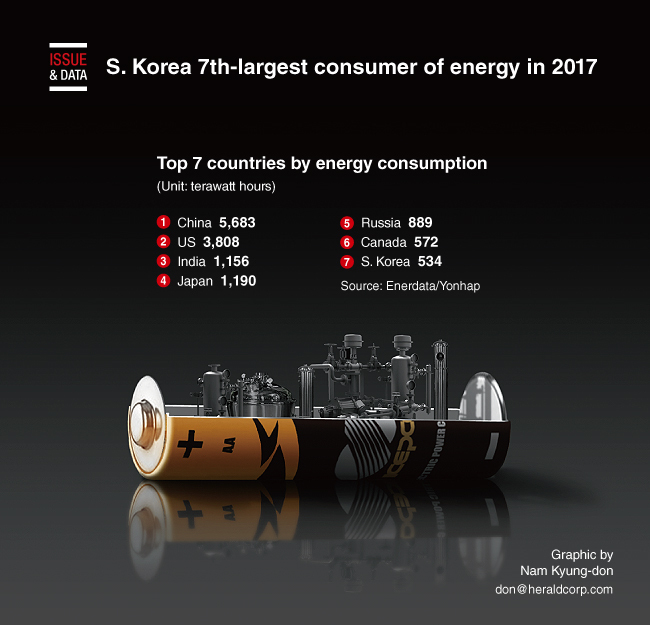 South Korea's energy consumption last year ranked seventh in the world, and showed one of the fastest paces of increase, data from a foreign consulting firm showed. South Korea consumed 534 terawatt hours last year, up 2.3 percent from the previous year, according to the Europe-based Enerdata. The country's ranking in terms of the volume of power consumption also rose from eighth the previous year. The ranking was ninth in 2015. China used up 5,683 TWh, and the United States 3,808 TWh. India followed with 1,156 TWh.